At the rate I’ve been going through sunflower seed this fall, a second mortgage is looking like a distinct possibility. The dozen or so Purple Finches that have been with us since mid-September have been particularly voracious eaters. However, I’m not complaining. Although these attractive birds show up at our feeders most falls, rarely do they linger this long. Anyone who feeds birds on a regular basis knows that the number of individual birds and the variety of species showing up at feeders varies widely from one year to the next. Last year, for example, things were quiet. In 2012-2013, however, large numbers of winter finches – redpolls, siskins, grosbeaks, etc. – graced us with their presence. Why is it that finch numbers fluctuate so widely? The short answer is food. 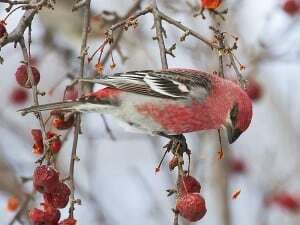 Winter finches move southward when there is a shortage of wild food – mostly seeds and berries – in their breeding range in the boreal forest of northern Ontario and Quebec. If seed crops are good in the north, the birds stay put. If food is lacking, however, they will sometimes fly thousands of kilometres to find it. 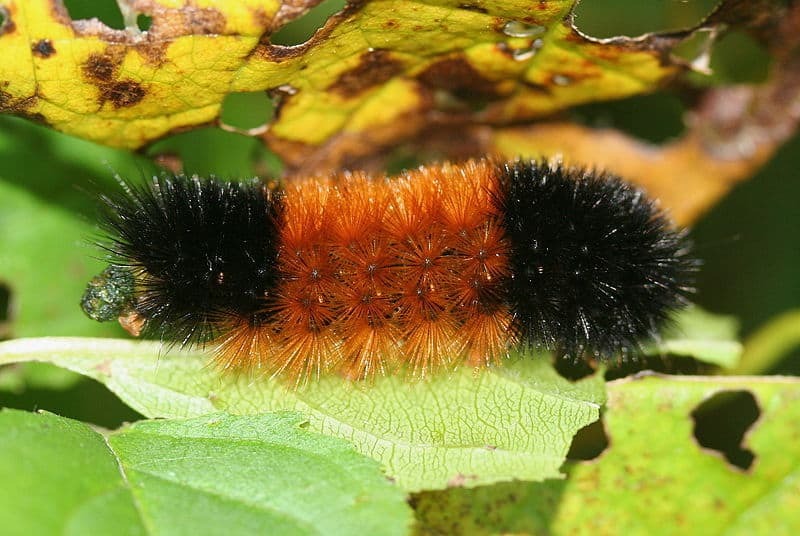 Whether they actually choose to spend the winter here in central Ontario and the Kawarthas depends mainly on the abundance of wild food crops here. Since the fall of 1999, Ron Pittaway of the Ontario Field Ornithologists has prepared an annual forecast of what winter finch species are most likely to make an appearance in southern and central Ontario during the upcoming fall and winter. The forecast is based on information he collects on the relative abundance of seed crops in the boreal forest. Much of the data comes from Ministry of Natural Resources staff. The key trees affecting finch movements are spruces, birches and mountain-ashes. So, what is the seed crop situation this year? According to Pittaway, spruce cone crops are excellent in the southern James Bay region and east across north-central Quebec. However, they are mostly poor elsewhere in the province, including the Kawarthas. 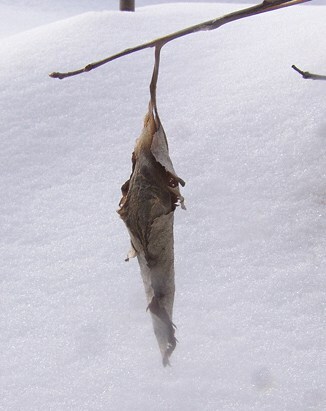 As for birches, the amount of seed is poor to average. American Mountain-ash trees, on the other hand, have produced a bumper crop of berries across much of the north, with the exception of northeastern Ontario. What all of this means depends on the bird species. Pine Grosbeak – One of our most beautiful finches, Pine Grosbeaks should make a small flight into the Kawarthas this winter, given the lack of mountain-ash berries in northeastern Ontario. Some may turn up at local feeders looking for sunflower seeds but most often you will see them feeding on European Mountain-ash and ornamental crabapples. This surprisingly tame species can be quite common right in Peterborough. Evening Grosbeak – Small numbers of Evening Grosbeaks should move south this winter into southern and central Ontario and may show up at feeders. Their numbers, however, are now much reduced from the population peak that occurred from the 1940s through the 1980s. The high population was linked to large outbreaks of spruce budworm, which occurred at this time. Budworms provided an unlimited source of protein for the grosbeaks, allowing them to raise a lot more young than usual. A decline in grosbeak numbers began in the mid-1980s when the size of annual budworm outbreaks decreased. Ontario’s breeding population of Evening Grosbeaks is now believed to stable. 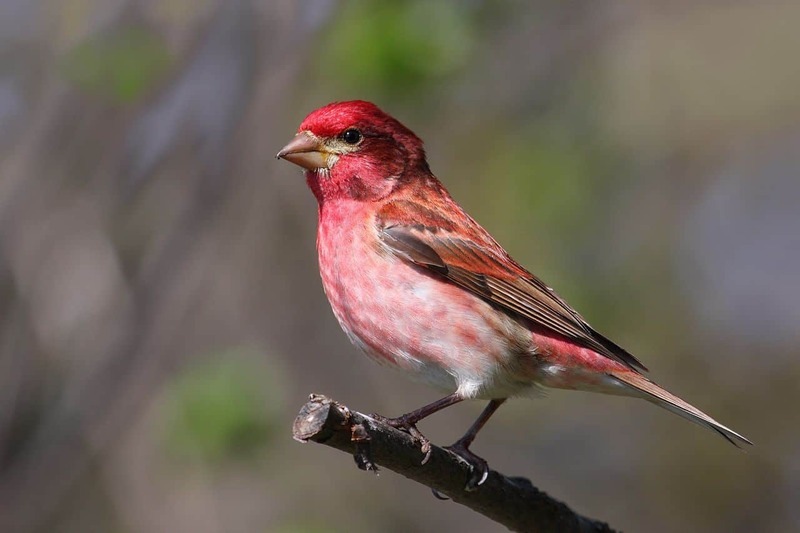 Purple Finch – Due to poor seed crops in central and northeastern Ontario, most Purple Finches are likely to migrate out of the province this fall and south into the U.S. Many are passing through the Kawarthas right now. In the 1960s and 70s, Purple Finches were much more common than they are today. As with Evening Grosbeaks, the principal cause of the decline may be the absence of large outbreaks of spruce budworm. Crossbills – Red and White-winged crossbill specialize in removing seeds from the cones of conifers. We may see some Red Crossbills this winter in areas of the Kawarthas where Red and/or White pines have produced a heavy cone crop. As for White-winged Crossbills, they will be mostly absent this winter from central Ontario, given the lack of cones on spruce trees. White-winged Crossbills move east and west like a pendulum across North America searching for bumper cone crops. Common Redpoll – Because the seed crop on birches varies from poor to only average in the boreal forest, a moderate to good flight of redpolls is expected this fall and winter as the birds leave the north in search of food. The question is whether there is sufficient seed on the birches of central Ontario to persuade them to linger here. At feeders, redpolls prefer Nyjer seeds. Watch for Hoary Redpolls, too, mixed in with the flocks of Common Redpolls. Pine Siskins – Siskins are expected to move east and west this fall searching for areas with abundant spruce cone crops. This means that many will probably spend the winter in north-central Quebec where spruce crops are excellent. However, those birds that fail to find adequate cone crops will probably wander south and some may turn up at local feeders. Like redpolls, siskins are attracted to silo feeders offering Nyjer seeds. Blue Jays – According to Pittaway, the acorn, beechnut and hazelnut crops were fairly low in northeastern, central and eastern Ontario this summer. We can therefore expect fewer Blue Jays at feeders , since most will migrate out of the province in search of these food items elsewhere. That being said, I’ve certainly noticed good acorn crops on many of the oaks in the Kawarthas, so it will be interesting to see if a number of our local jays decide to stay put. Red-breasted Nuthatch: This is a species that depends primarily on conifer seeds, so cone crop failures can cause these birds to move elsewhere in search of food. Some Red-breasted Nuthatches began wandering southward in mid-summer this year and more are expected to follow. Movements of Red-breasted Nuthatches into southern and central Ontario is usually a sign that some of the northern finches will also be showing up. At feeders, this species prefers black oil sunflower seeds, chopped peanuts and suet. 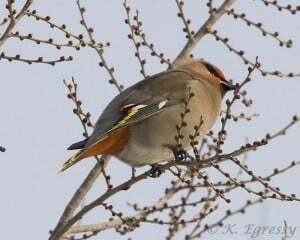 Bohemian Waxwing: Most Bohemians should stay in the north this winter, because of the large berry crop on mountain-ash. That being said, we almost always see at least a few flocks of this species in the Kawarthas in winter. This may be partly due to the local abundance of European Buckthorn, a non-native shrub that produces a large berry crop nearly every year. 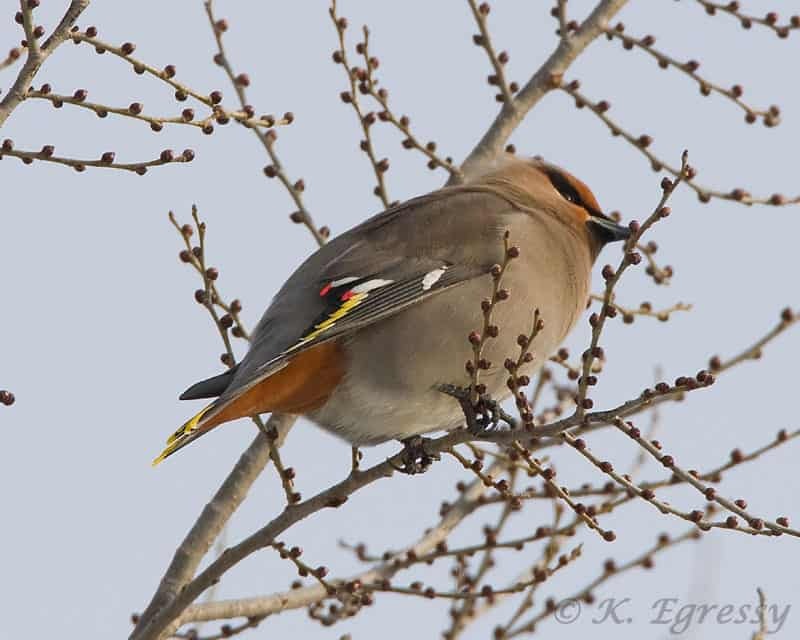 Bohemian Waxwings are also attracted to European Mountain-ash and ornamental crabapples. In recent years, these handsome birds have expanded their breeding range east across northern Quebec. If you feed the birds, you can support bird research and conservation at the same time. Join Project FeederWatch and share information about which birds visit your feeders between November and April. This will help scientists at Bird Studies Canada and the Cornell Lab of Ornithology track changes in bird numbers and movements. Participating is easy. Just count the numbers and kinds of birds at your feeders, and enter the information on the Project FeederWatch website (or on printed forms). Last season, more than 3100 Canadians took part in this North America-wide program. More information can be found at http://www.birdscanada.org/volunteer/pfw/ or by calling Bird Studies Canada at 1-888-448-2473.